Sonic Quest 3 is the third issue of the Sonic the Hedgehog comic series Sonic Quest miniseries, the third of three parts. It was released in February 1997. Continued from Sonic Quest 2. The events from the previous issue are told. King Maximillian Acorn has been rescued from the Zone of Silence, but upon returning, his mind became scrambled and his body started to undergo an unknown crystallization process. The only glimmer of hope for the King was a brief reaction to Sonic's billionth ring. Upon seeing this, Sally Acorn broke the Freedom Fighters into two groups to retrieve more rings. Infiltrating Dr. Robotnik's new Death Egg, Tails found a disabled SWATbot and wore it as a disguise to determine what the doctor is up to. At the same time, Sonic accessed the Death Egg by destroying the roboticized Condorbot. Robotnik, in an attempt to fully power his station, crashed the Death Egg into the Floating Island in an attempt to retrieve its two Chaos Emeralds. As the Floating Island is pushed into the sea by Robotnik's Death Egg, Tails is present in the bridge with him, deciding to escape while the doctor is busy. Unknown to him, Sonic is nearby, at the door to the bridge, noticing Tails. As Tails exits, Sonic swoops at him, but Tails notices him in time allowing him to duck. Nonetheless, Sonic attacks again, hitting Tails with a spindash to the helmet and then hits him in the back with a kick. He kicks him again, as Tails calls out to stop. He hears his voice, and notices two tails sticking out of the broken back panel of the SWATbot, finally realizing that the bot is Tails in disguise. He helps Tails up, curious as to how he got on the ship and into a SWATbot suit. Tails mentions that he will tell him later, instead, wanting Sonic to focus on stopping Robotnik. Sonic enters the bridge, throwing himself at Robotnik to bring an end to his evil deeds. Just before hits Robotnik, a strong plexiglass barrier stops the hedgehog, while Robotnik notes that he's known that Sonic has been on the vessel for some time. As he recovers from the hit to the head, another plexiglass wall drops behind him, trapping him in the room as poison gas is pumped into his area. Robotnik stops the progress of the Death Egg, just so he can watch Sonic succumb to the poison with his own eyes. All of a sudden, from the front of the bridge, Tails jumps through the window, using the jet-powered boots on the SWATbot. He then uses the laser blasters on the SWATbot's wrist to destroy the bridge's consoles, allowing the plexiglass wall to open and for Sonic to escape. The destruction of the consoles disables the downward thrusters on the Death Egg, taking it off the Floating Island and sending it straight for space. 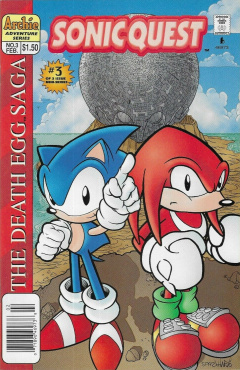 The inertia of the rising Death Egg prevents Tails, Sonic and Robotnik from being able to move, leaving them helpless as the Death Egg moves out of control upward. Robotnik, prepared for such an emergency, activates a stabilizing field from his robotic wrist, giving him control of his movement again. He then jumps into a hatch leading to the auxiliary control room, while Tails and Sonic can do nothing to stop him. Meanwhile, on the Floating Island, with the Death Egg heading back for space, the island moves out of the sea and back to its proper orbit. The Chaotix take this time to assess any damage to the island, while Knuckles swears on making sure Robotnik never does such a deed again in the future. Robotnik arrives in his auxiliary control room, intent on repairing the station, ridding the Freedom Fighters, and finally roboticizing all of Mobius. He activates a camera display, sending a message to Sonic and Tails, who have escaped the bridge to locate Robotnik. He announces that he has prepared a special guest for the two, featuring some design elements from Mecha Sonic, but pumped up much more so. He introduces his new machine as Silver Sonic. Suddenly, Silver Sonic comes crashing onto the bridge, a larger and silver-mechanical version of Sonic. Sonic orders Tails to return to the bridge to see if he can find a way to stop the Death Egg while he takes care of Silver Sonic. As Tails leaves, Sonic taunts his counterpart, thinking no duplicate can defeat him. Despite his confidence, Silver Sonic punches Sonic, sending him flying back through the Death Egg's corridors and into a wall. The strong punch doesn't dissuade Sonic, as he jumps out of the wall in a Super Peel-Out and gives Silver Sonic a left-hook. The attack does nothing, so Silver Sonic replies by slamming Sonic into the floor. It prepares to stop on Sonic to destroy him once-and-for-all, until Sonic notices that there are broken live wires in the hole in the floor he was punched into. Right before Silver Sonic can get the stomp on Sonic, he takes out one of the live wires and touches it with the robot's leg, causing it to be electrocuted. It falls on the ground, destroyed, upsetting Robotnik over another failure. He initiates 'Plan E', intent on destroying Sonic himself. He enters a change room in his auxiliary control station, emerging wearing a suit similar to features on the Death Egg that he calls the Eggs-O-Skeleton. As he uses the rocket boots on the suit to intercept Sonic, he notes that the circuitry in the suit is connected to the Death Egg, granting him the immense strength of the station. As he arrives in the room, he notices Silver Sonic getting back up. He freaks out as Sonic, now in Silver Sonic, reveals that he has taken Tails idea, using Silver Sonic's husk for his own needs. He gives Robotnik a punch, but he barely avoids it. He responds by flying into Silver Sonic, but that isn't enough to stop the robot, as it kicks Robotnik aside. Both Robotnik and Sonic are quite angry, as their battle really starts to heat up. Tails arrives back, witnessing the battle from aside. He steps in when Sonic flicks Robotnik up into the higher decks of the station. Tails quickly alerts Sonic that he got the self-destruct working on the station, setting it for twenty minutes. However, the battle between the two damaged many systems on the station, so he believes the self-destruct could occur at any time. Despite the risk, Sonic wishes to continue the battle with Robotnik, to finally finish him off, but Tails tries to convinces him to leave, or all of them could be destroyed. Sonic reluctantly agrees, and starts following Tails to find an exit. They arrive at an airlock, which also houses a magic ring junction box full of rings. Sonic, using Silver Sonic's body still, grabs a handful of the rings to complete their mission, then jumping off the station with Tails. As the station starts to rumble, Sonic grabs Tails to protect him from reentry, then asking him to use his tails on his signal to slow their descent. Once they pass through the atmosphere, Sonic jumps out of the suit, grabbing the rings and telling Tails to hover them down to the planet. They eventually arrive on the surface, their objective to find rings a success, but they find themselves a long way from home. Meanwhile, everybody on the planet notices as the gigantic Death Egg explodes while in a low-orbit, from Knothole Village all the way to Robotropolis. As Sonic and Tails watch the explosion from the edge of a cliff, they notice that their communicators have become active again. They contact Sally, who notes that King Acorn's condition has turned to critical, ordering them to return to the village at once. The two dash off to return to the village with rings in hand, curious if Antoine and Bunnie Rabbot have located rings as well, and if Robotnik was able to survive the explosion. Back at Robotropolis, Robotnik returns via a parachute, noticing that his city has been renamed 'Snivopolis'. He crashes into his penthouse office, where Snively is sleeping on his chair. Robotnik falls on the chair and Snively, unaware that he was there, only wondering why his office is full of houseplants, flowers and a picture of Snively's mother. He stands up and furiously calls out for Snively, who is pancaked on his back, wondering if it would be better for him to stay there, or face the music. The cover of this issue is the same as that of the title screen of Sonic & Knuckles. This is the last issue of the last mini-series to be created by Archie for the Sonic series, until Archie adopted a mini-series style for Sonic Universe. Silver Sonic is shown, an upgraded version of Mecha Sonic. Its design is similar to that of the silver Mecha Sonic from Sonic 2, except much taller.